William Lines, from their very start and even when their fleet was not yet big always stressed the Southern Mindanao routes, a stress that was even over that of their stress in Northern Mindanao. They have their reasons and it might be economic. Maybe the political came later. It is known that Mr. William Chiongbian, the owner and founder was for a long time a Congressman of Misamis Occidental and was even Governor. Panguil Bay and Iligan Bay was the only consistent stress of William Lines in Northern Mindanao. In Southern Mindanao his brother James Chiongbian was a Congressman for long time of the southern portion of the old Cotabato province. In Southern Mindanao, for decades William Lines maintained the Manila-Cebu-Tagbilaran-Dumaguete-Zamboanga-Dadiangas-Davao route and even early the company devoted six ships of their fleet in that route to maintain a thrice a week departure from Manila. Even when the former passenger-cargo ships from Europe arrived, William Lines simply plugged it in those routes in place of the former ex-”FS” ships. Later, that basic route had variations like dropping Tagbilaran in one or two of the schedules or inserting Iligan in that schedule or going first to Davao than Dadiangas. When the era of fast cruiser liners arrived with only one intermediate port in the route, William Lines acquired and fielded the fast cruiser MV Manila City in the Manila-Zamboanga-Davao route in 1976. 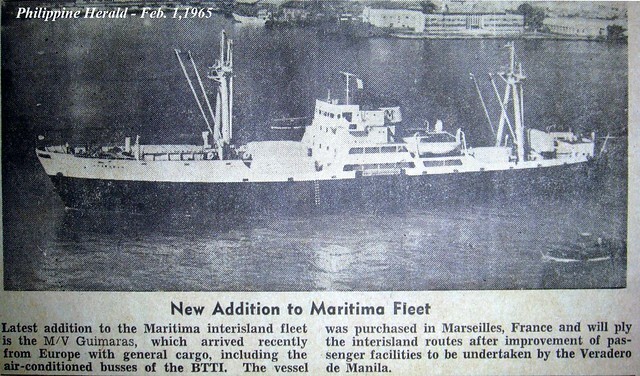 This was actually the second MV Manila City in the Wiliam Lines fleet after the first MV Manila City which was an ex-”FS” ship. Later the second MV Manila City dropped anchor in General Santos City on the way back to Manila. Gensan was the base of Mr. James Chiongbian and the passenger and cargo of Gensan are too big to ignore when it was just on the way. The MV Manila City was first in competition with the fast cruiser liner MV Dona Ana (later MV Dona Marilyn) of Sulpicio Lines which was augmented later by the fast cruisers MV Don Enrique (later MV Davao Princess and MV Iloilo Princess) and MV Don Eusebio (later MV Dipolog Princess) in 1978. These Sulpicio ships were doing the Manila-Cebu-Davao route. The MV Manila City was faster but she was doing the longer route. All of them were capable of completing the whole route in just a week. 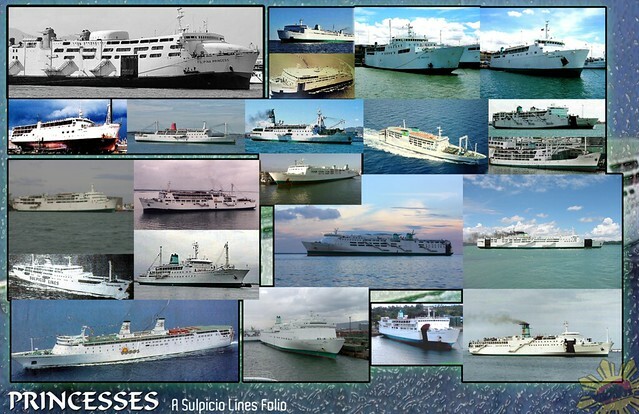 Later, in 1979, the Dona Ana was pulled out from the Davao route and she was placed in the twice a week Manila-Cebu route when the flagship of Sulpicio Lines, the MV Don Sulpicio was hit by fire near Batangas while on a voyage. For 15 long years from 1976 until her death in 1991, the MV Manila City was the only fast cruiser of William Lines in the Southern Mindanao route and she had to contend with the MV Don Enrique and MV Don Eusebio of Sulpicio Lines. For most of this period the MV Manila City was augmented by the other cruisers of William Lines including the former passenger-cargo ships from Europe. Two of them, however, the MV Davao City and MV Zamboanga tried a direct route to Davao. The MV Dumaguete and MV General Santos City also did a Manila-Zamboanga-Davao route. The late 1970’s was no longer an era of too many intermediate ports. Even Sulpicio Lines was also in this new trend in this era. From 1979, however, William Lines also joined the new paradigm and bandwagon which was containerization. The new container ships made direct sailings with no intermediate ports like a direct route to Davao or General Santos City. With that there was less need to send passenger-cargo ships to Southern Mindanao. However, the MV Manila City continued on its old route and sailed faithfully. The MV Manila City was a ship built in 1970 by Mitsubishi Heavy Industries in its main yard in Shimonoseki, Japan. Her original name was MV Nihon Maru. She was young when she was sold to William Lines in 1976 at only 6 years of age and use. Her former owner in Japan was Mitsubishi Shintaku Ginko and her ID was IMO 7005798. The ship’s external measurements were 106.3 meters by 14.0 meters by 6.2 meters and her original gross register tonnage was 2,998 tons. She had a maximum speed of 20.5 knots when new from her twin Mitsubishi engines that totaled 8,800 horsepower (this was high at its time and actually the highest for the local liners from 1976 to 1980). So she was actually bigger and as fast the flagship MV Cebu City of William Lines. She was dubbed as the “Sultan of the Sea” by William Lines. In the Philippines, the MV Manila City had a gross tonnage of 2,961 with a net tonnage of 1,648. The ship had the highest gross tonnage in the William Lines fleet before the arrival of the MV Dona Virginia. She had a passenger capacity of 1,388 which is again higher than the flagship MV Cebu City. The ship was billed as fully air-conditioned. It seems in the 1970’s this was already the standard for a luxury liner (of course they also touted the passenger service and the food plus the entertainment). As advertised:”The ship is equipped with the latest navigational and life-saving equipment including self-lighting lamps, an automatic signal transmitter and the latest in compasses and radars. It is fully automated, with the engine room controlled from the bridges.” (From Times Journal, September 24, 1976). The ship had a raked stem and a cruiser stern. She had two masts, two side funnels and three passenger decks. She had an observation deck atop her bridge which is accessible by passengers. Her loading capacity in Deadweight Tons was 3,766 tons which was higher than the DWT of MV Cebu City. In later years, the departure of MV Manila City from North Harbor changed. At one time she also dropped anchor in Odiongan before proceeding to Zamboanga. This was in the late 1980’s when William Lines was maximizing its routes by dropping by on additional ports in Panay and Romblon. 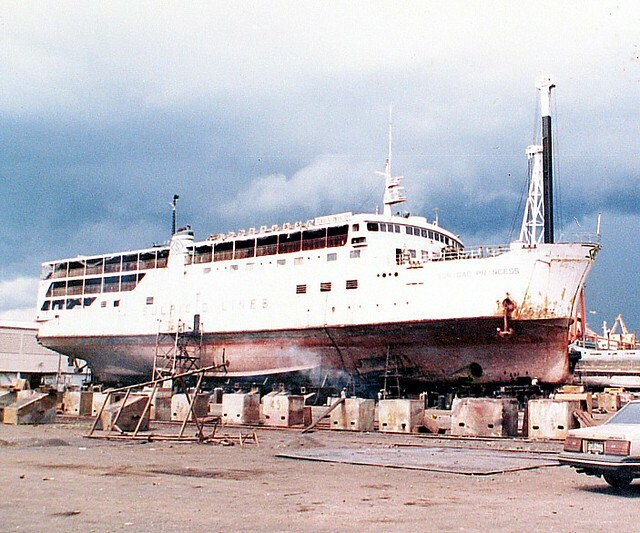 On February 16, 1991, the MV Manila City was on drydock in Cebu Shipyard Engineering Works (CSEW) in Mactan island. While in a graving dock and hot works were being done on the ship by a sub-contractor, the ship caught fire. The next day the ship sank and was declared beyond economic salvage and repair. The vessel was insured was P45,000.000 (in 1991 currency). She was broken on January 1992. The MV Manila City was replaced initially by the MV Zamboanga City, a RORO liner, in her route. In 1992, her replacement vessel, the MV Maynilad which was a much bigger vessel came. However, this ship, though beautiful and well-appointed was a disappointment in speed since she can only do 15 knots when new which was significantly below the speed of the vessel she replaced. She can also do the route in also one weak, though. The MV Manila City was a good ship. It is just too bad she did not last long like her contemporaries in the Southern Mindanao route.